In many ways, Bucharest made me feel like a spy. And while most days, I’m much more Cookie Monster than James Bond, the mysterious allure of Romania’s capital made me realize one thing: sometimes travel espionage brings massive rewards. You see, Bucharest is not a city for lazy sightseers. To understand why it’s special, you need to dig. Those who don’t will leave feeling sorely disappointed. While travelling around Bulgaria, there seemed to be a unanimous sentiment among the travellers I met that Bucharest was a ‘one day city’, best glazed by on a Balkans road trip en route to vampire hunts in Transylvania, or lazy beach days along the coast. And I get it – Bucharest is not just massive… it’s busy, chaotic and aesthetically stunted by decades of communist rule. On the surface, it’s just another ‘big city’, except lacking the polished, touristic grandeur of other European capitals. But here’s the thing: much of what makes Bucharest special is hidden in plain sight. Artsy garden oases tucked behind crumbled facades, colourful cafes behind unassuming and narrow entrances. Those attempting to pinpoint the uniqueness of Bucharest might say that it’s like a newbie Berlin or an Eastern twist on Paris, but in my opinion, these comparisons fail to capture the complexity of Romania’s underrated capital. Bucharest is like a secret for the cool kids – if you know where to look, you will inevitably fall in love. So here’s your invite into the cool kid club – a guide to the hidden beauty of Bucharest, and where to find it. PS: If you’re looking for more practical tips on the city (e.g. costs, public transit, etc. be sure to check out this epic guide via Romanian Friend). Caffienate (or booze up) in secret. Lurking behind many of Bucharest’s unassuming facades are delightful pockets of paradise, where comfy seating, quirky décor and affordable drinks welcome you with open arms. Acuarela is one of my favourite cafes in the world. Walking in, it’s almost like you’re stepping into someone’s backyard, but venture further and you’ll find a cute little bar, colourful canopies of vibrant umbrellas, eclectic knick knacks and yes, even free watercolours to paint with (just ask nicely!). A perfect spot for a lazy afternoon. Hidden behind the Ştirbey Palace on Calea Victoriei, there’s Gradina Eden, a little jungle oasis smack dab in the city center. With plenty of tables, hammocks and comfy seating, it’s the perfect place to escape for a few hours. Looking for more secret bars? Just ask a local. In my experience, Bucharest residents are more than happy to share their favourite bits of the city with visitors! Unlike many major cities which charge 3 limbs for dibs on their snazziest viewpoints, Bucharest operates a little differently… there are no calf-busting cathedral climbs or fancy elevator rides to viewing platforms. Rather, the best views seem to earn their rep through word of mouth. The Pura Vida Skybar is my personal favourite for a gorgeous view over Old Town. The catch? You need to lug yourself up several flights of stairs, all the while wondering “am I really allowed to be here?” The brief anxiety (and workout) is worth it though – they have killer cocktails and an even better view. Whether it’s scaling abandoned buildings or hunting the streets for massive murals, much of Bucharest’s ‘cool factor’ lies in its alternative scene. To feel like an urban Indiana Jones, try your hand at exploring some of Bucharest’s abandoned buildings. Blogger friends of mine did the Beautiful Decay Tour through the Interesting Times Bureau, and I’ve heard nothing but rave reviews. 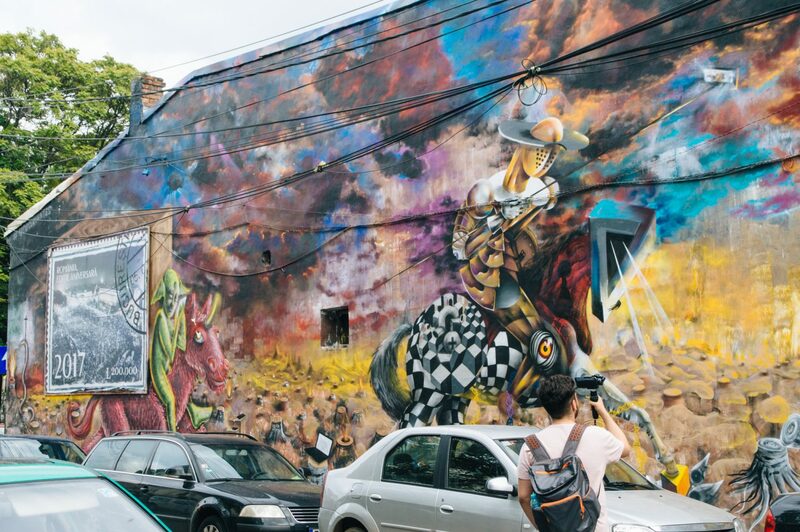 For street art, though there aren’t many large, accessible murals in Bucharest’s center, you’ll find some very cool pieces scattered throughout the city, especially on Strada Arthur Verona. For a guided tour with proper explanations from a local perspective, check out the Alternative Tour offered by Open Doors Travel. Many of my favourite Bucharest discoveries came by accident… making a wrong turn into an alley dotted with rainbow umbrellas, stepping through an unexpectedly glamorous passageway, sneaking into a closed-off orchestra rehearsal. Here’s a magical secret about Bucharest – many of its most amazing sights are literally just a step off the main streets. Find Pizza Colosseum, a little pizza place off of Calea Victoriei and enjoy the colourful whimsy of the street’s umbrella rooftop. Step into Macca Villacrosse Passage, a dreamy and picturesque passageway in the heart of Old Town, with a variety of cafés, bars (and shisha) to enjoy. 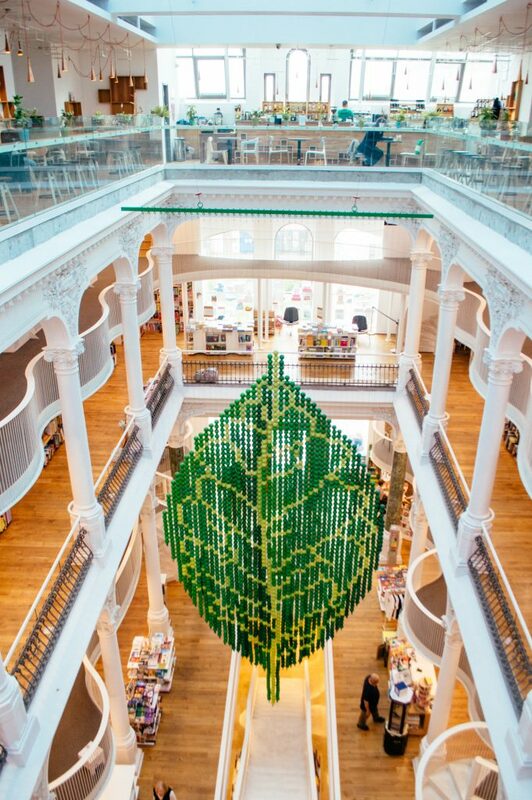 Cozy into literary heaven at Bucharest’s gorgeous bookstores. Carturesti Carusel is a popular photo spot, with a picturesque and quiet cafe on the top floor. Carturesti Verona offers an endless burrow of rooms to explore, selling all kinds of books and knick knacks. PS: They have a secret garden too. 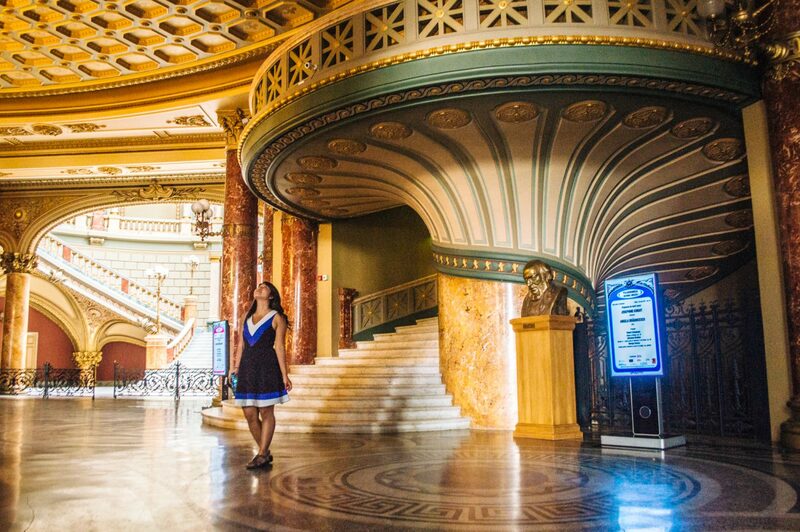 Last but not least, take a peek inside the Romanian Athenaeum – usually open to the public unless there’s rehearsals or performances going on. The easy-to-miss entrance is on the side of the building, and if you ask extra nicely, the guard might even let you in while a rehearsal is taking place (for a small fee of course). I had to save the best for last. 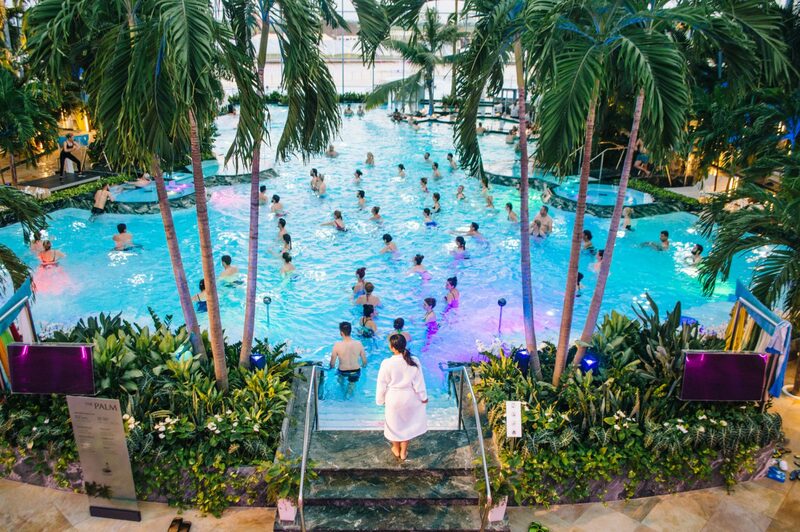 Therme Bucharest (located near the city’s airport) is one of the coolest, most ridiculously wonderful hidden gems of Romania (maybe even the world). Imagine clusters of swimming pools (complete with in-water bars), insane saunas (including one that screens movies) and countless water slides, food options and opportunities to lounge until you’re pruny… All for the ludicrously low price of about 15 euros. Anywhere else in the world, this would cost double. So what do you say, cool kid? At the risk of sounding like a total hipster, the time to visit Bucharest might just be now… before the rest of the world catches on. A huge thanks to the Experience Bucharest team for hosting me during my stay and showing me the best of their city! All photos and experiences are my own. The street art is amazing, and that last picture of Therme Bucharest looks insane! It sounds really fun as well! Omg this just looks so pretty. I love going to places where there’s tonnes of hidden gems! Looks like it’s got everything I love.m- good food, beautiful view points and loads of street art! Love the idea of exploring abandoned buildings too! Yes! What I love about the “pretty” spots in Bucharest is that they’re hidden, and you really need to look for them, which means no long queues of eager Instagrammers like in some other cities hehe. Thanks for reading, Laura! what’s awesome is there are a lot of budget airlines that fly there, so you can probably grab cheap flights for a quick weekend break. That spa is right by the airport… just sayin’ 😉 Thanks for reading, Sara! I would love to be a spy just walk in the Bucharest streets to discover many secrets ! The street art is amazing 🙂 and I would of course go the the Thermes ! Apparently, there’s tonnes of hidden gems in this city ! yes it’s such a fun city to explore, since you feel like you’re discovering everything for yourself 😉 A really nice alternative to overly touristic capitals, that’s for sure! Holy crap Christina that’s gorgeous! Luckily I plan to go to Romania soon and now have my own secret source haha. Like, free watercolors, seriously. I’ll probably spend a whole day just doing that. PS: Love that green dress – I have it too! yayyy I hope you have an amazing time in Romania!! And lol same name, same dresss… look at us twinsies 😉 Seriously though it’s the best dress ever. I’ve had it for like 2 years and still wear it all the time haha. I was also planning to join the abandoned buildings tour, but sadly I did not have time as we got back too late after our road trip around the country. I think a lot of people feel that way about Bucharest when they first visit! It’s definitely not one of those cities you fall in love with at first sight (at least not for me), but the extra effort was so worth it, don’t you think?? BTW, I’m so jealous you got to road trip around Romania. I only saw Bucharest this time around but am SO keen on heading back to see more of the country. You absolutely should! We saw so many beautiful places, both charming cities and villages, interesting sights and stunning nature. We got to cover quite a large part of the country (did not go to the seaside), you can see our route on; https://travellinn.net/2015/12/16/road-trip-in-romania-a-suggested-itinerary/. Well, I fell in love at first sight four or five years ago, travelling across Europe by train – so much that I emigrated here from the UK two and a half years ago, and have never looked back. You’ve picked an excellent list of places (I was in Eden only last Thursday – every year it is rumoured someone will finally do something with the derelict building out front and it will close, but thankfully not so far, and I love the little arcades and coffee shops between Lipscani and Calea Victoriei), but one of the charms is every local will have their own favourite bodega or secret garden to introduce you to. I’m not telling you mine of course, as a spy I’d have to kill you after ;-). Really glad you enjoyed this beautiful city I’m proud to call my home. The beauty may not jump out at you on first sight, but it is there – and above all, it’s a genuine beauty that doesn’t pretend to be something it isn’t or hide from its past. Aww I love that you’ve moved there! Sometimes when you visit a place, you just “know” that it’s the right fit. I felt that way about Munich, and I can’t wait to move back there again soon. Hahah it’s a shame you won’t share your favourite spot with me, but maybe with my detective skills, I’ll someday find it on my own 😉 And yes, I went to Therme on a weekday, thank goodness! I’ve heard that the crowds are insane on the weekends! Hey, Tim! It would be my pleasure to sometimes get out for a drink(if you need another driend in this busy city). Cheers! Beautiful recount, I think Eastern European cities – especially minor ones or those capitals off the radar – need this type of visitor. There is beauty, one just needs to find it. Looking at the pictures you took of the bars and library it really reminded me of Krakow some 10-15 years ago, when such charming places started blooming in areas that were way too famous for their ugly post-communism monotony. Yes! It makes me so sad when people deem Eastern Europe unworthy of visiting just because it’s not as photogenic as some other bits of the continent. In some ways, I prefer it just because you get to discover these places on your own (without feeling like one of a million tourists). It’s also incredible in these cities to feel history come alive, because so much of their struggles are still relatively recent as well! I’d love to visit Krakow someday… I haven’t yet made it to Poland! 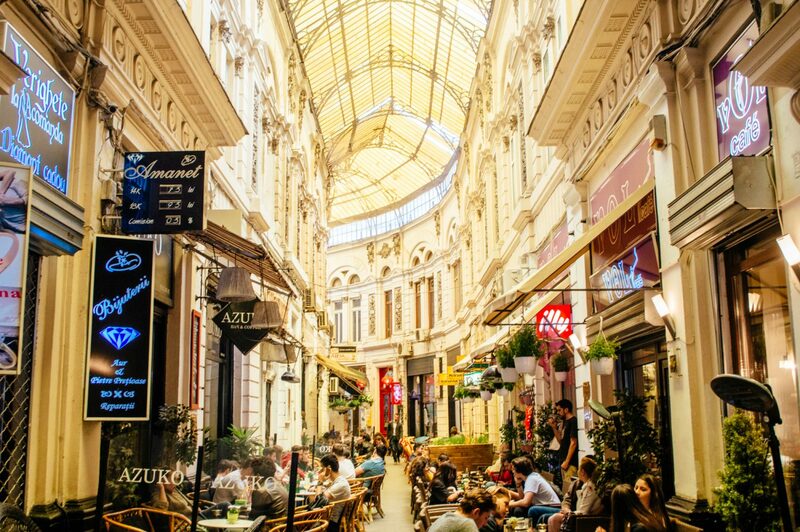 Holy cow, Bucharest looks like an absolute dream! It’s so colorful! I bet I could while away a whole afternoon in one of the cafes you mentioned, and the Therme Bucharest sounds amazing. There’s definitely no way I’d skip Bucharest. In fact, it just pushed it’s way towards the top of my list! Wow, just reading about what Bucharest has to offer and how it calls for adventurous souls make me want to pack and go! 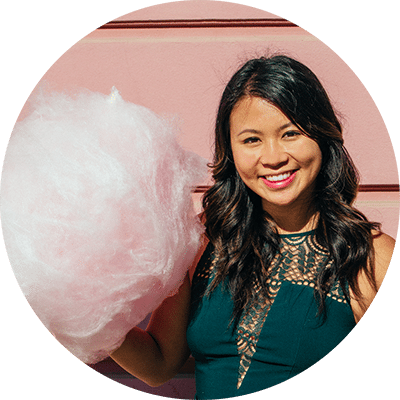 I’m all for explore uncrowded cities and discovering hidden gems! 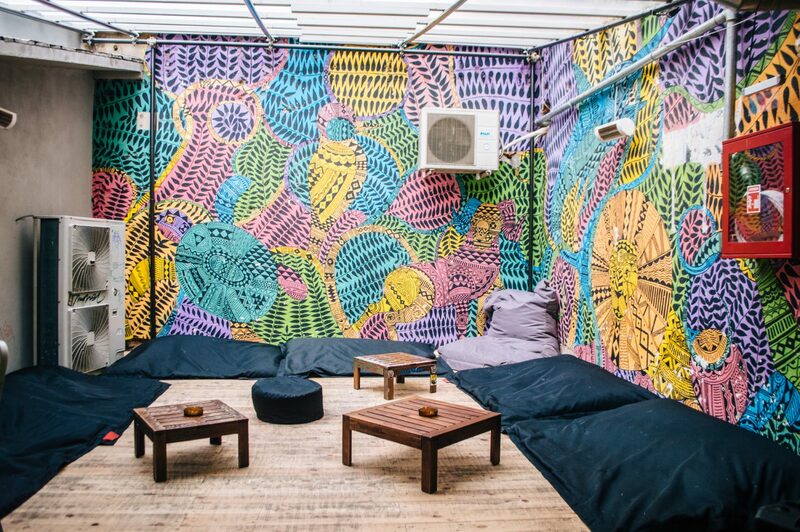 Yes to street art, drinks with a fab view, architecture and thermal baths? Why, yes please! Great write up and thank you for the tour! Ahhh Karla, Bucharest sounds like a perfect fit for you then! <3 Thanks so much for reading. Hope you make it there soon! Glad you liked our city, Christina, there’s plenty more to discover! And the best part? You haven’t explored the rest of the country to see how beautiful it is! Let me know when you plan on coming back for another visit – plenty of things to do with friendly locals (see my link). Thank you for writing such lovely words about Bucharest! I am glad you enjoyed these places, but there’s plenty more to discover, Bucharest and Romania has so many lovely places. I must say i didn’t knew about the Arthur Verona street, but I will be visiting it soon, so thank you for showing it to us. yay! so glad it got the Romanian seal of approval haha 🙂 you really need to visit Therme. it’s ridiculously good. Thanks again for your recommendations!! Hidden gems are the best! I love finding them as well as all that street art! Thanks Christina for this,you just made me fall in love with Bucharest. I am a South African planning to visit Instabul and i was looking for a place I could go to for a day before i heard back to SA. Bucharest will be that place i spend the day at. How far is the airport from the city center and are all these places mentioned above around the city center and can be done in a day? Thank you so much Christina for the feedback. Am landing around 8 pm. So it should be nice and quiet at that time. I will have to just take pics only in some of the places. I have also received a few pointers from people that stay in Bucharest on which other cool spots I can visit. Hi Christina. I love how you included all kinds of interesting things to do in Bucharest, especially since most people tend to check a many popular tourist attractions from a huge list. Those should also be included, but truly exploring a city is even more interesting.